Working towards something significant is sort of like surfing. You have to paddle against the tide to reach the wave and if you stop paddling the tide will push you backwards. But if you just keep going you might finally hit the wave. When you do you might fall off your board. Or, what you thought was a big wave might turn out to be just a ripple. You don’t stop because one day you might just catch the big wave. When you do, you’ll ride that wave and though it requires skill it will seem effortless. Because all the time you thought you weren’t getting anywhere you were actually acquiring the skills you needed to ride the wave. Every time you tried standing and fell off you learned. Every time you went for it you learned. With every wipeout your skills improved. And when you learned the skills you needed the wave was there and you caught it. 1) You have to put your toe in the water. You have to get going, you have to get out there and it all starts with one small step. Waves don’t just jump in to your lap, you have to go find them. 2) You’re going to fall down. Expect to fall down. There is a learning curve involved in everything new that we do. To think otherwise is to let your pride get in the way. Our pride doesn’t want us to make mistakes. 3) You’re going to get up. Experience is the best teacher. Every time you fall down you learn what not to do. Be grateful that you can get up. Your pride might be hurt but a little bruised pride never hurt anyone. 4) You’re going to fall down again. Think of it as another learning opportunity! Every stumble brings you closer to mastering the skill. 5) You’re going to get up again and this time you’ll catch the wave! Maybe you’ll have to repeat the fall down/get up cycle a few more times but every try increases the odds that you will catch that wave. When do you catch your wave you’ll be propelled along by the momentum and all that paddling and falling off will have been worth it. 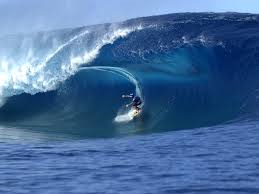 One thing is certain, if you stop paddling you’ll never reach that wave. My encouragement for you is that you will take that first step and if you’ve already taken the first step, you’ll keep getting up until one day you’re riding the wave of success. That day could be right around the corner. Remember, you can achieve whatever you believe as long as you are willing to work for it!